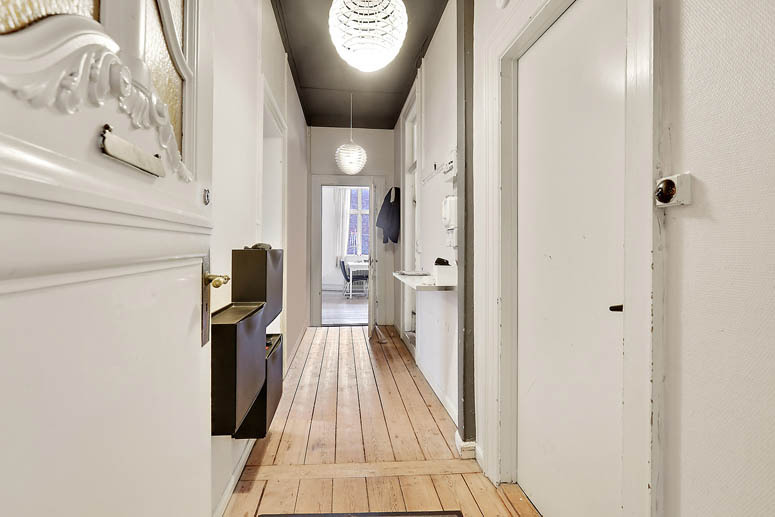 A big Aarhus city apartment only comes on the market once in a blue moon. 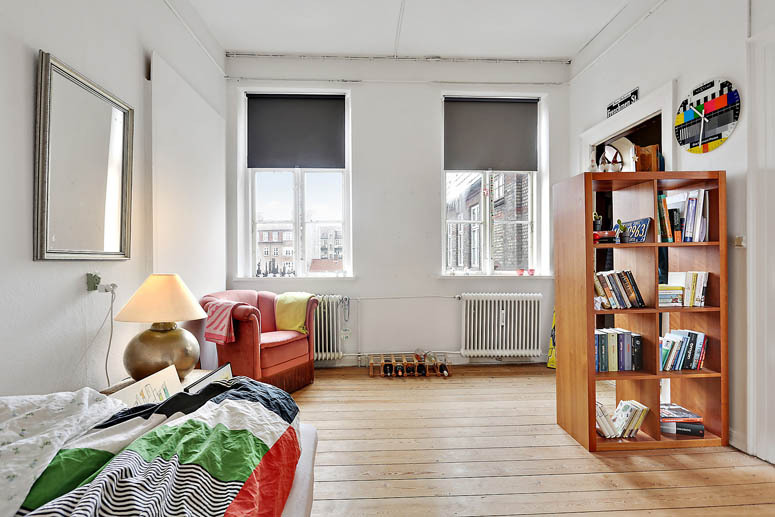 A typical Aarhus city apartment has one to three rooms. You can find some four and five room apartments, but six or seven rooms is practically unheard of. So, imagine my glee when this seven room apartment came on the market in the Latin Quarter! The Latin Quarter is my dream neighborhood because it’s in the middle of everything, with its cafes and little independent shops giving it a nice bohemian vibe that’s far from the scruffy feel of Aarhus’ actual bohemian neighborhood. We knew going in that it would be a fixer upper, but the bones… OMG, the bones of this place! 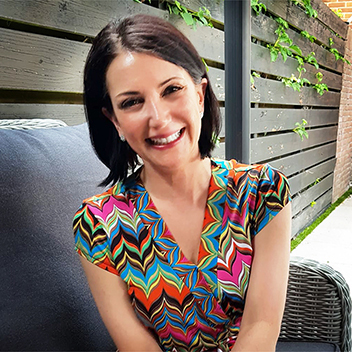 The size of the rooms, the transoms, the cool windows, the high ceilings, this place looked like my fantasy Aarhus city apartment, and as long as I agreed to deck it out in mid-century modern design, Robert was willing to indulge me. 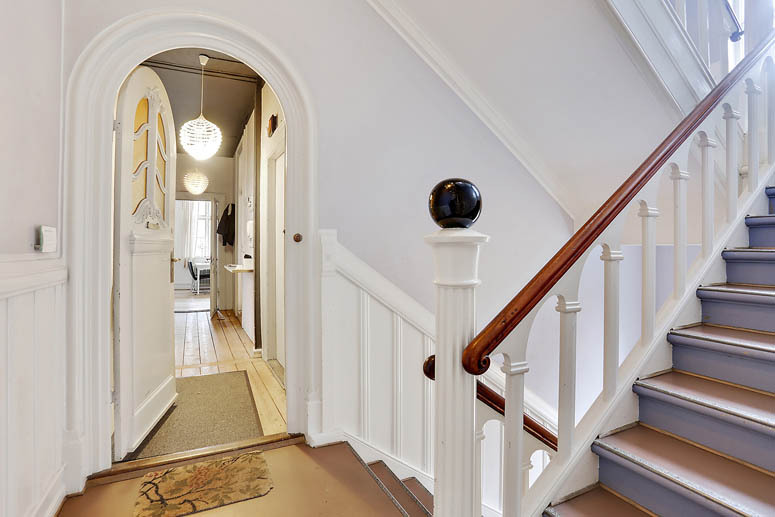 A typical Aarhus city apartment stairway, but check out that awesome door! It’s not looking good… how old is that lightswitch and how may layers of paint are we dealing with? Look at the size of this room, and the shape of those windows! That city view is why I want to live in the middle of Aarhus, the 2017 European Capital of Culture! 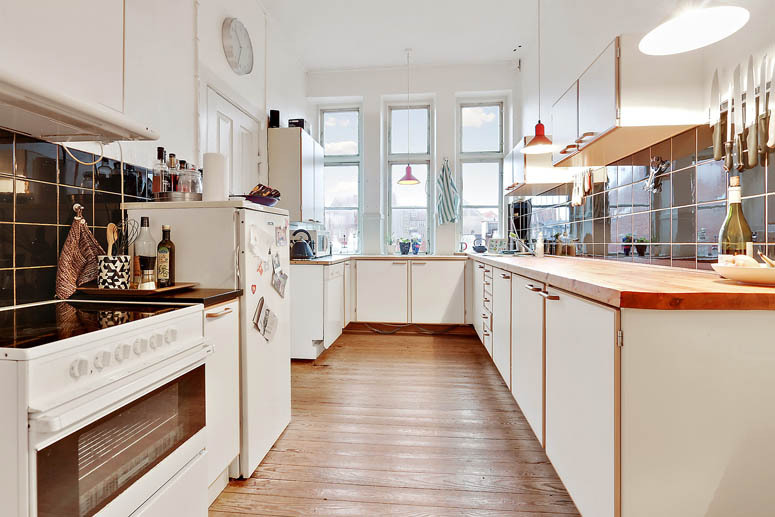 This kitchen is huge even by Danish house standards and I know exactly how I’d renovate it! Unfortunately, this bathroom should be condemned. 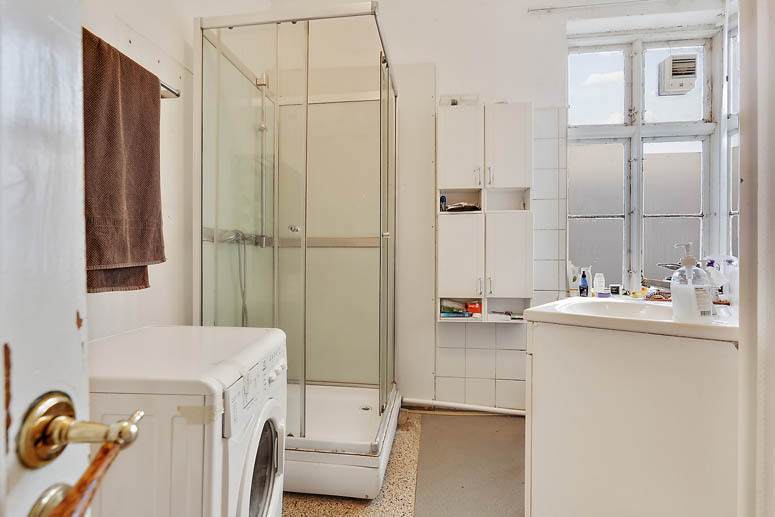 We are completely ok with renovating a kitchen and a few bathrooms, but this apartment had been rented out to Aarhus University students since the 1970s and it was in a terrible state of repair. The electrics needed complete refurbishment, the windows needed to be replaced, and we’d have to get a professional to remove those many layers of old paint. This place needs restoration, not renovation. This apartment could be absolutely stunning, and we’d considered it for a minute, but the dealbreaker was that we wouldn’t be able to live there while the restoration was going on. 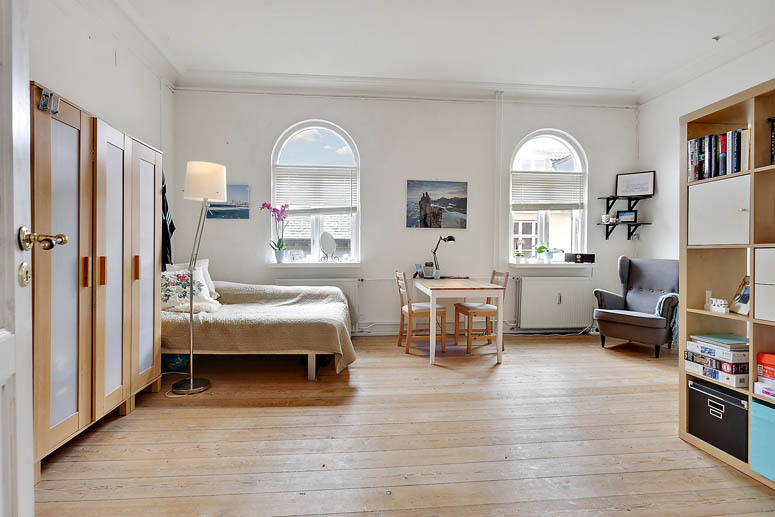 It would be an uncomfortable stretch to keep our current apartment in Frederiksbjerg while paying a mortgage and contractors on the other place, and we’re concerned that we’d pay out more than the apartment would ultimately be worth. The Latin Quarter isn’t a very desirable area of the city for people who would have the means to buy a fully restored seven room apartment when we go to resell. People with money are moving out of Aarhus city apartments to the trendy and newly built apartments on the harbor front. Robert would love to live in the Iceberg, but it’s really not my style, you can see it here. 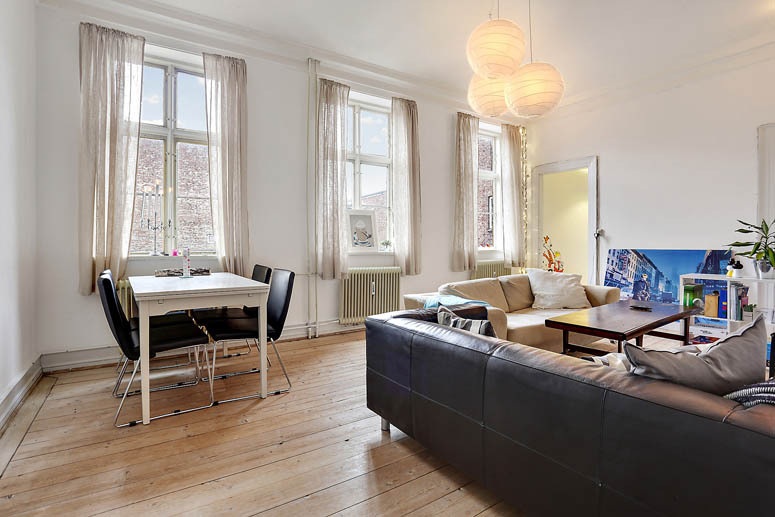 And so our search for the perfect Aarhus city center apartment (or house) continues. Yes the apartment looks amazing – the size of the rooms is remarkable. But you’re so right! How could you do it up and pay to live elsewhere too? Sorry to hear your quest continues, but wishing you very good luck in finding the perfect place for you in this beautiful city. Thanks so much for the well wishes, Sarah. We saw two more today, but still haven’t found the one. It’s starting to feel a bit like online dating! This is an absolute stunning apartment and I am sure it would look remarkable when it was renovated. The amount of light that the windows bring in is amazing. I hope you are able to find your dream home soon and that it won’t be so much work. Thanks, Gwendolyn. It’s paining me to pass this one up. It seems most properties here are either in need of major restoration, or have been ruined by recent modernization attempts. I do not want to see spotlights in a late 1800s apartment! Actually, they’re not. It’s a whole different story in person, and the vintage switch is a safety hazard, along with the vintage wiring. It’s a gorgeous place, I can’t believe all of that space! The doors and windows are to die for, and the light coming in is amazing. It’s really too bad that it wouldn’t be worth fixing up, but I totally understand your reasoning. I hope someone is able to restore it at least a bit and and really enjoy the beauty of it. There’s a huge student housing shortage in the city, and the most likely scenario is that an investor will buy it, do minimal work and continue to rent it out to students. There’s a lot of money to be made in the student rental market. Unfortunately, a lot of beautiful properties are being ruined in the process. The demographic of our neighborhood has changed for the worst in the past few years as people have bought up apartments and started renting them to students. What used to be a quiet neighborhood of mostly professional couples has turned into a pigsty made up of mostly student rentals. This is such a beautiful property! I love the size of it and how much light is coming into every room. With the renovations this place would be absolutely beautiful. Good luck with your search. I love all the space in this apartment. 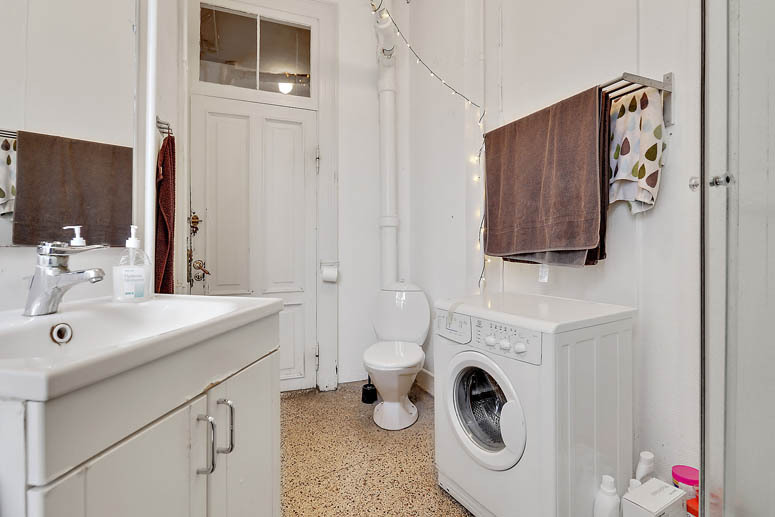 I’m not so sure I’d like my washer or dryer in my bathroom though. Best wishes finding the perfect living space. It’s amazing what I’ve gotten used to after living abroad for nearly six years, but I can’t say I’ll ever love that arrangement and I think having it in the kitchen is slightly worse. They’re doing it that way in new construction, too. Even in fancy places like the Iceberg!